These Halloween Desserts Will Impress Everyone! Are you guys as ready for Halloween as I am? I already have the house decorated and have gotten completely in the spirit! One of my favorite parts about this Holiday is all of the fun Halloween Desserts I get to play around with. Sure, candy is the big hit this time of year but we always go to a family member’s house for Halloween so the kids can trick or treat together. It makes me happy to bring some fun Halloween-themed desserts for everyone! These cheesecakes are the perfect simple dessert for Halloween! Make these for a classroom, your next Halloween party, or just for the family at home! These are simple yet unique and the design is so easy to master! Find all of the details plus the full recipe on Hungry Happenings right here! These adorable Halloween cookies are more than just your basic dessert! On top of being so fun, they also have a surprise inside! These little witches hold a super sweet candy treat! Get all of the details and the full recipe from Hungry Happenings right here! 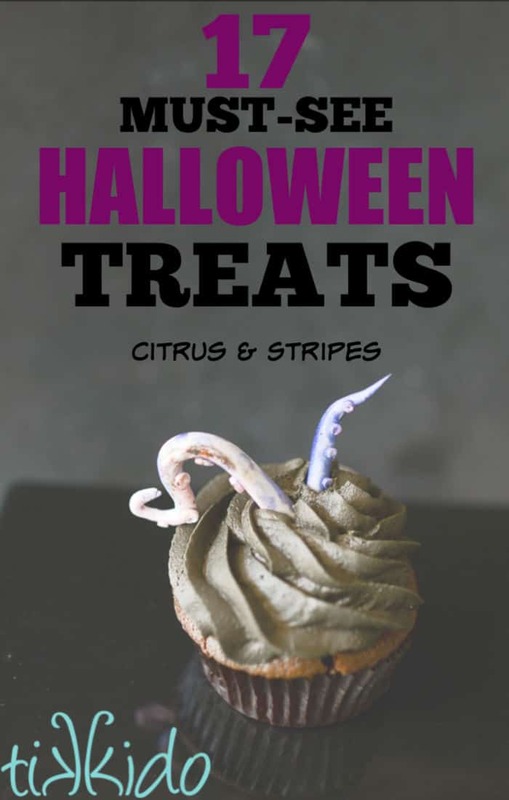 A super fun Halloween twist on a classic recipe! These cookies are so adorable and the bright green color gets them plenty of attention! If you love the Hotel Transylvania movies, or just Halloween in general, try these! They are a great dessert to let the kids help out with! Get the full recipe and details from Chicken Scratch NY right here! The classic Tim Burton film, Beetlejuice, takes a brand new shape with this fun Halloween treat! Perfectly decorated and so delicious, this swiss roll cake is a must-try! Get in the spirit for Halloween by making this fun cake for your next Halloween baking sesh! Get the full recipe from Cultureatz right here! These festive cupcakes are perfect for this Halloween season! They are super easy to decorate, even for the total novice baker. As easy as they are, they are hugely impressive to guests! Get the full recipe and all of the details from Ottawa Mommy Club right here! Okay, these might be one of the coolest Halloween creations ever! These are perfect as a creepy Halloween dessert OR even a Little Mermaid themed party! These tentacles are so much easier to make than you might be thinking! Also, there is a delicious chocolatey surprise in the center... you have just got to check these out for yourself! Get the full recipe from Tikkido right here! These ewwy gooey creepy blood-covered bone cupcakes are gorgeous! These will be a huge hit this Halloween, for the adults and kids alike! Find the full recipe right here from Ottawa Mommy Club! This amazing brownie recipe includes not 1, not 2, but 3 incredible Halloween designs! All 3 of these are surprisingly easy and SO fun! The Cousin It one might just be my favorite! See all of the designs plus the full recipe from The Anthony Kitchen! There is no denying how cute these are! They are simple, delicious, and perfect for everyone! With these being flourless, they'll fit into most anyone's dietary needs! Get the full recipe from Hungry Happenings right here! This is such a cute cake for Halloween! The kids will absolutely love the goofy little face on this bat. Plus, it certainly won't hurt that it is so easy to execute! Find the full recipe for this Halloween Bat Cake from Hungry Happenings right here! When it comes to The Nightmare Before Christmas, you can find Jack Skellington cookies galore. The fun part about THIS Nightmare Before Christmas recipe is that it is Sally focused! These are so simple to make that even the least experienced one in the kitchen can master these! Check out the recipe from Chicken Scratch NY right here! If you have never tried Oreo truffles, you are missing out significantly! These truffles alone are so delicious but the cute Halloween twist makes these such a fun treat! Bat wings made from chocolate... need I say more? See all of the details with the entire recipe from Ottawa Mommy Club right here! 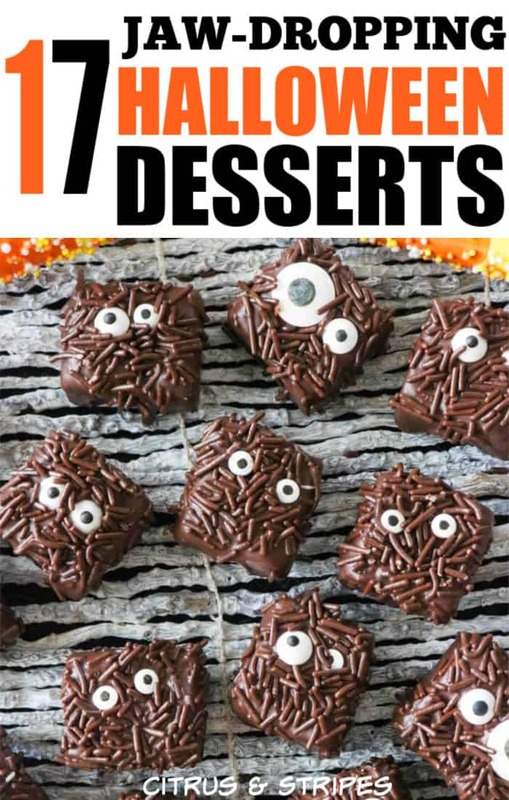 The only thing I love more than fun Halloween desserts is EASY Halloween desserts! Thankfully, these look perfect and will wow your guests while still being so easy to make! They're creative and cute without being over the top on the difficulty scale! Check out the recipe from The Anthony Kitchen right here! These are amazing and creepy and SO creative, all at the same time! These cookies are without a doubt, going to be the talk of any Halloween party or event they're served at! As amazing as these look, you'll be shocked to see that they aren't as complex as they look! See the details for yourself on Tikkido right here! An awesome twist on the classic meringue! These ghostly treats will surely delight the kids and adults alike. See how easy and delicious these are on Served From Scratch right here! There is no BAD time of year for anything Butterfinger related, is there? These blondies happen to fit perfectly in the Halloween theme while being CRAZY good! See the recipe and try them yourself at The Anthony Kitchen! Learn how to make some of the most adorable iced sugar cookies this Halloween! These are so stinking cute, it can't be denied! See the instructions on these awesome cookies right here at The Anthony Kitchen.